My parents called one day to say we had to see something very strange they had sighted from their second floor window. Their apartment overlooked the golf course with a sweeping view of the valley. We were used to seeing red tailed hawks, Canadian geese, red-winged blackbirds, mallard pairs, tall blue herons and golfers furtively moving their golf balls! But this new sighting was a strange critter we had never seen. There were two of them. Over the next weeks we watched as these two dark balls of fur waddled and scurried along the water’s edge. They almost looked hunch-backed. Occasionally they would dive into the water to hide. They were almost two feet long and the tail added another foot to their length. Before long we saw an increase to the family. Four baby fur balls were added to the tribe. Our mission was to find their identity. One quick call to the Fish and Wildlife Service and we had our answer. 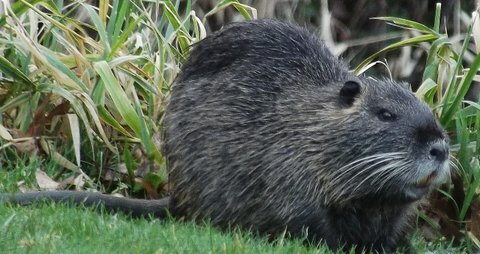 Meet the nutria, classified as a Prohibited Aquatic Animal Species. They are rodents originally native to parts of South America. By 1930, advertisements offered the sale of nutria for their fur and to help control excess plant growth in streams and lakes. 30 years later, we are still watching these crazy critters in the slough near our home. I use the zoom lens on my camera to take pictures. I’m not sure exactly how close I really want to get to them! Don’t want anyone to call me crazy! This entry was posted in Photography, Wildlife. Bookmark the permalink. 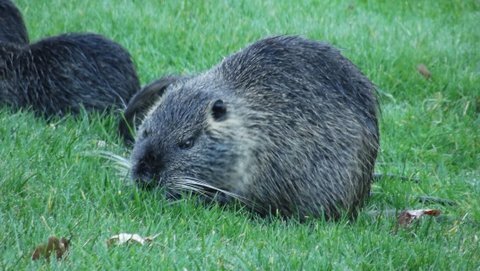 I saw some nutria when I was visiting Louisiana and at first I thought they were some kind of mutant jumbo rat. I confess I was bit (as in a lot!) unnerved. But it’s heartbreakng how often we keep making the mistake of introducing species into non-native areas and then there’s needless suffering all around. My family loved the descriptive term “mutant jumbo rat”!! Too funny…you nailed it! Exactly true about introducing non-native species. Did you hear me screaming in the car the other day?! Research is being done here in the Northwest on eliminating tent worms. One of the studies suggests introducing a Chinese insect to eat the worms. The researcher said the insect would not do damage to our environment! I’m sure that is exactly what they thought when the Nutria was introduced! I mean…really! Wow, this is really cool info. The first thing I thought of was the muskrat in the Caddyshack movie! You’re right, Amy! I forgot all about that muskrat! These critters…although invasive…have given our family hours of enjoyment. They are such funny things waddling on the banks! So happy to help increase you wildlife knowledge!! You never know when you might encounter one of these things! By the way, my husband and I always enjoy your outdoor photography!